The Qadiriyah, the oldest order in Islam, was founded in Baghdad by Abdul Qadir al-Jilani in 1166 and introduced to Harar in Ethopia in the fifteenth century. During the eighteenth century, it was spread among the Oromo and Somalis of Ethiopia, often under the leadership of Somali shaykhs. Its earliest known advocate in northern Somalia was Shaykh Abd ar Rahman az Zeilawi, who died in 1883. At that time, Qadiriyah adherents were merchants in the ports and elsewhere. In a separate development, the Qadiriyah order also spread into the southern Somali port cities of Baraawe and Mogadishu at an uncertain date. In 1819 Shaykh Ibrahim Hassan Jebro acquired land on the Jubba River and established a religious center in the form of a farming community, the first Somali jamaa. Outstanding figures of the Qadiriyah in Somalia included Shaykh Awes Mahammad Baraawi (d. 1909), who spread the teaching of the order in the southern interior. He wrote much devotional poetry in Arabic and attempted to translate traditional hymns from Arabic into Somali, working out his own phonetic system. 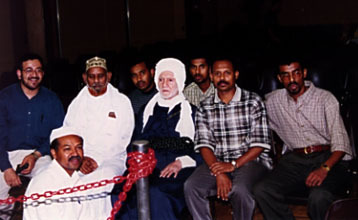 Another was Shaykh Abdirrahman Abdullah of Mogadishu, who stressed deep mysticism. Because of his reputation for sanctity, his tomb at Mogadishu became a pilgrimage center for the Shebelle valley and his writings continued to be circulated by his followers in the early 1990s.